← Wenger In In In In In In In! Arsenal-Everton. Match Preview, Predicted Line-up. Beat the Merseysiders–Both Blue and Red (Go Boro)–and CL football is Ours. It’s the end of the season–but it isn’t–given that we’ll be playing in the FA Cup final next Saturday. We cannot look ahead, however, and Arsenal must focus on our home match vs Everton–which we must win, while perhaps keeping an eye on Anfield–where we hope that Middlesbrough can get a result at Liverpool. If all that goes our way, another season of Champions League football would be the reward. There’s also a scenario where Manchester City could fall out of the top-4 positions, but we would have to win while they lose at Watford–all in a fashion where a five goal differential is reversed. At least we have something to play for and stranger things have happened. In fact, we only have to look back to this round of matches last season. Spurs were set to finally finish ahead of Arsenal, only needing a result at already relegated Newcastle. That one ended in a 5-1 drubbing and Arsenal sneaked in for a 2nd place finish in the league with a home win over Aston Villa. Finishing ahead of our arch rivals put the tiniest bit of gloss on a disappointing season where all the big clubs faltered and the title was there for the taking, but for plucky little Leicester City, of course. The regret was somewhat mitigated by the fact that we looked fairly well positioned for this season, though we all knew the big money clubs would throw stacks at their own troubles. Chelsea did just that and seem reasonably worthy champions under Antonio Conte. We’ll deal with them next week when we preview our attempt at preventing them from winning a domestic double at Wembley. Spurs now have finished ahead of us, winning that honor in emphatic style with a victory in the final North London derby held at White Hart Lane. Despite finishing a distant third among the London clubs, there are a couple of bright spots. Manchester United will finish below us in the league–despite hiring the most despicable character in all of football management, Jose Mourinho, AND spending massive amounts of money–but they still have a shot at Champions League football if they can beat Ajax in the Europa Cup final. With a win over Everton we would finish on 75 points; already we’ve beaten last season’s total of 71. Everton, on 61 points, will finish 7th whether they win, lose or draw. In other words, they have nothing to play for. 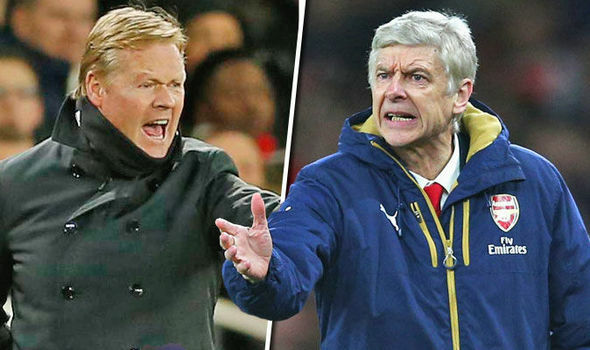 Don’t try to tell that to Ronald Koeman, a manager who seems to enjoy getting one over on our own Arsene Wenger. In 2007, managing PSV Eindhoven, Koeman knocked Arsenal out of the Champions League in the round of 16. At Southampton, his teams took several points from Arsenal that might well have served us. The four we shipped to them last season put a real dent in any challenge we might have made in closing down Leicester. Finally, Everton’s 2-1 win in this season’s reverse fixture back in December ended Arsenal’s long unbeaten run and popped a sizable hole in our confidence ahead of further disappointing results. Additionally, Everton are replete with quality players who might be trying to put themselves in the shop window for a summer move to a bigger club or richer contract. Most notably, center forward Romelu Lukaku looks primed for a big money move. The towering Belgian has 24 league goals–just one ahead of our own Alexis Sanchez–and looked strong for the league’s Golden Boot award until Harry Kane scored four in midweek. Still, a goal or two wouldn’t hurt his highlight reel. We shouldn’t put all our defensive focus on Lukaku, however, as his countryman Kevin Mirallas is a very talented attacker as well. Enner Valencia can score goals too and 18 year old Tom Davies has impressed with his work-rate and ability to pop up in dangerous spots. Leyton Baines and Ross Barkley are always good at shots from distance, sending in crosses and otherwise playing in their teammates. Their corner kicks and set pieces could be a route towards goal given veterans like Phil Jagielka and Ashley Williams to aim at. Wenger will try to counter Everton’s threat while also priming his players for the cup final next Saturday. This match comes at the end of a difficult run of five games in two weeks so tired legs might need to be rested and a couple of players could be given run-outs to see if they can do a job at Wembley. Still, with the top-4 places on the line and nearly a full week of rest before the cup final, I expect Wenger to play his strongest available team. Injury news suggests that Alex Oxlade-Chamberlain is still out, Laurent Koscielny could play and that Aaron Ramsey has recovered from the injury that saw him subbed out in the 2-nil win Tuesday night vs Sunderland. I think the latter two will both start and that we’ll see just one change (Koscielny for Gibbs) from the group that went in the last one. Of course, some will argue that greater rotation is needed and that maybe some of those who have been in training ought to get a shot too. Players like Mathieu Debuchy, Lucas Perez and Per Mertesacker get mooted (or at least copied and pasted) into some observers’ preferred line-ups. Should Wenger mix things up at this late date? No matter who plays it’s a must-win game. We need to give ourselves a shot at a top-4 place while hoping Boro can somehow eke out a result at Anfield. Moreover, failing to beat Everton would undermine our confidence ahead of the cup final and tinge what’s sure to be an already uneasy lap of honor after another disappointing league season and loud calls for Wenger to end his long reign at the club. All of that comes after the match is over. While we play we must stay in the moment. Instead of focusing on the difficulties this past season presented, Arsenal should look to build on their recent run of good results: seven wins from eight matches since switching to a 3-4-3 formation. For the manager and his players, it’s one last chance to hone that style of play before the cup final. Difficult as it might be, we need to neither look forward towards Wembley nor backwards at the season as a whole. We must also shut out any news of scorelines from other stadia around the league that might excite or mute our focus on the football being played. Concentrating on the task at hand–finishing off the league season with a victory over Everton, the only thing Arsenal will have any power over come Sunday at 3 pm–is all that really matters. 84 Responses to Arsenal-Everton. Match Preview, Predicted Line-up. Beat the Merseysiders–Both Blue and Red (Go Boro)–and CL football is Ours. Injuries permitting, I think your predicted line up is what we’ll see versus Everton. 1. Defensively, the back seven (i.e. the back five and 2 CDMs) predominantly sit deep, focus on maintaining their defensive structure and shape, stay compact and tackle and intercept. As for Alexis, Giroud and Ozil, I would like to see them remain around the halfway line and press the opposition’s defenders when they are in possession of the ball. 2. In terms of transitional play, I’d like to see Debuchy, Xhaka and Monreal as Arsenal’s primary outlets to transition the ball from defence to attack. Specifically I envisage that they would do so predominately by executing long range passes into the channels for Alexis and Perez respectively. This should be a tough match as Everton have been playing quite well this season, with Lukaku, Gueye, Barkley and Jagielka, in particular, impressing. Their left flank, predominately comprised of Miralles (LW), Davies (LCM) and Baines (LB), has been weaker than their right flank this season, so Arsenal should be able to make some in roads attacking down the right. Hoping for another entertaining performance from the Gunners. COYG! I don’t read your comments (either…) as they’re just cut and pasted from your earlier ones… I did catch the original part at the bottom about Everton and you make some interesting points. I’m not sure why you want to undermine your original thoughts by regurgitating the other stuff over and over. Of course, I follow a bit of a formula in writing my previews and I harp on (and on) about the same issues about the club myself, so I probably shouldn’t throw stones in a glass house. Bravo, HT, for a job well done. We do our bit and leave the rest to the stars. Your line up looks very much like it to me. Kosh’s fittness appears one that is simply being managed and with nearly a week to the FA, I expect him to play so Monreal replaces Gibbs. Everton plays expansive football, more so now that nothing is at stake for them except pride. So i expect an expansive game. Because of that the only change I would wish made in your line up is Welbeck for Giroud. If we beat Everton our chances of qualifying for CL I’d put at about 17% (5:1). That gives hope but mind, I won’t place my money on it. I wouldn’t risk Koscielny if there is any doubt, we need to protect him to ensure that he has as long a career as possible. Long term it would be beneficial if Laurent calls it a day playing for France after the next World Cup. Good post 17tino, has Wenger actually beaten Koeman, because I’m not sure he has?! I guess in a season where Arsene recorded his first ever league success over Mourinho that a win over Koeman should be the next logical step. Usmanovs $1.3b bid for Kroenkes Arsenal interest comes at an interesting time with the St Louis lawsuit pending and I have heard stadium issues with one of his other franchises. Is there an increased offer from the ‘big guy’ in the pipeline? Rumour has it that there are other bidders circling. Will missing out on CL, crowd antipathy, boardroom discontent, have an influence? Has Total got a kilt? The timing of Usmanov’s bid is rather curious seeing as we play Everton, a club in which he has some sort of interest on Sunday; could it be the news has been leaked by Farhad Moshiri, his good friend and former Arsenal shareholder, who recently bought into Everton? Anyway, that’s a matter for another day. We have to remain focused on the task of beating Everton, scoring as many times as possible. 17ht, I think the squad you predicted will be just about what Wenger puts out. Of course, I will rather have Welbeck instead of Giroud to match Jagielka for pace and strength, especially as we are unlikely to win too many headers against the Everton defence. So, why not keep it on the ground, play Alexis as main striker and Welbeck from the left, plus as auxiliary striker? That’s what I will do. Both Alexis and Lukaku are in pursuit of a top goals scorer’s spot and Alexis should be given a chance as he has the incentive to score goals. I also agree with Kev that Koscielny should not be risked if he isn’t 100% or if playing Sunday will affect his level of fitness for the final. Let’s hope it’s going to be a really “squeaky bum time” sort of game for City and ‘Pool. It’s the last day; anything is possible. Hmm. Hoping 17ht posts the confirmed team sheet soon. But suffice it to say Mustafi is out and replaced by Gabriel while Kos starts. Lukaku will avoid Gabriel’s side of the central defence area. Welbeck also starts, as I expected. Hopefully, there’s a role for Giroud later in the game. Arsenal: Cech, Holding, Koscielny, Gabriel, Bellerin, Ramsey, Xhaka, Monreal, Ozil, Sanchez, Welbeck. Subs: Mertesacker, Giroud, Ospina, Walcott, Iwobi, Coquelin, Elneny. Everton: Robles, Holgate, Ashley Williams, Jagielka, Baines, Gana, Schneiderlin, Davies, Valencia, Lukaku, Mirallas. Subs: Barkley, Kone, Barry, Besic, Pennington, Hewelt, Joe Williams. Touché, Kev. He can be too pedantic at times too. Heart’s thumping now; can only imagine how the nerves play on those to go onto the pitch…. Anyone heard any reason why Mustafi is out? Seems Mustafi is ill, maybe a dodgy tummy? I think Bellerin saved Welbeck’s blushes there. What a miss! Harry Kane scores, it’s his golden boot. What a miss by Welbeck, I meant to say; and good to be 1-0 up so early. Will that build up the nerves at Anfield and Watford for our rivals? I like Welbeck, he has great movement, is strong and quick but he just isn’t prolific enough. Harry Kane scores again, 28 for the season. Let’s hope the urge for the golden boot doesn’t influence Sanchez’s game. How can that be a red card for Kos? I said it about Michael Oliver. He’s on a mission here. How can he show a red for a tackle that we see every game? Mertesaker to come on now? Will it then be Mertesacker on or do we just go back to a back 4? Or, Monreal dropping back? What a mess the ref has made of this game and our chances. This is certain to pile on pressure on us now. The boys have to fight. We can still do this. Eris, tbh I’m more worried about the cup final, we’re seriously going to miss Koscielny at Wembley. 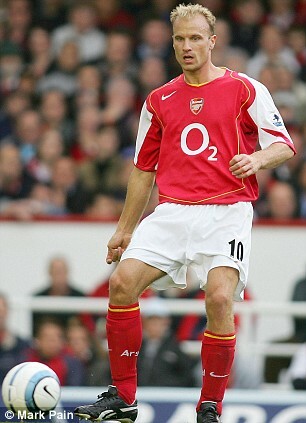 17tino all the guys on the BBC say it was a definite red card, that’s Keown, Kilbane and Crooks. Koeman has made a tactical change, brought on Ross Barkley. Gooooaaal! Why has welbecked appeared to have stood still? Kev, it is 2-0 Alexis!!! Talk about chilling. Lol. Got to leave for an event now. Lucky charm in place though. It will be hard to keep Everton at bay, but it’s possible. Interesting to hear Stan Kroenke is ambitious for Arsenal and he wants to see us win the EPL and CL. Holding, Mustafi and BFG for Wembley? All over now, maybe Wenger should be thinking ahead to the cup final and protecting players if he can, like Alexis. Eh boys, not our day after Atkinson let Pool off the hook. So be it. Apparently John Terry discussed with Conte and arranged the ‘guard of honour’ at Stamford Bridge before the game, premeditated and self indulgent by Terry. We are still able to deploy Holding, Nacho and Mustafi for Wembley. And deploy Gibbs and Bells on the wings. Bad refereeing cost us 6 points, as Liv should be a man down in 2 straight games, which weren’t given. Thanks FA. We appreciate what your bad referees are doing. Maybe I should do a TA and not watch the league games. So, Thursday night footy for us, which isn’t ideal at all. Oh well, it was too little too late, in the end. Looking at how badly we were playing in March, I think the boys showed some gumshun to recover composure and rack up the wins we did between April and May. Alas! It was as if our rivals, their opponents, the refs and the FA all conspired to ensure we suffered the inconvenience of Thursday night footie. It’s going to be alright and the fans will soon adapt. Now, to go and watch my recording of the rest of the game I couldn’t see. And Kroenke must sell his stakes. We have to buy more players to match the extra games we needed to play, and to Kroenke, money is in his pocket. I say take them out, and spend on what we need. That’s the thing, JK. Fans blame Kroenke but the appeal he had for the existing shareholders, before he was allowed to gradually buy up the shares he required to become owner, was his willingness to uphold the age old values of the club, including allowing it to be run from internally (football) generated resources; a long held philosophy that’s met with admiration by all. Like other shareholders, Kroenke is yet to take dividends off the profits of the club, so this money in the pocket narrative is baffling, at times. Of course, the business now belongs to him and by implication, all monies made. But in the financial records, he has not taken dividends (there was this speculation of some £3m payment as consultancy fees to one of his companies which provided invaluable services to the club; that caused some hue and cry like £3m pounds will improve his multi-billion dollar resource. I gest). Let’s see what happens after the impending board meeting. Maybe, the club will agree to change its philosophy and Kroenke will oblige with some injection of funds for player purchases and maybe, the salary cap will be removed so Alexis and Ozil can be paid handsomely. There’s also the issue of coming to terms with the loss of revenues from being absent from the CL and if the club has to cut down on cost and shed some weight in terms of player sales, etc. Whatever happens, it will be affect the medium term to long term outlook of the club. We have been served caviar for so long, we may find the adjustment period of returning to this new ‘diet’ of sausages a bit long (playing with one of Arsene’s famous quotes there), though. So, on the rebound, then! If it is 30 hours, it means South East Asia or Western Australia. Will write something later as what I had written just now had been lost. Haha!, JK. Actually, just about 25 hours in the end. And, no, it is to Canada…..from Lagos, Nigeria. Still feeling it, so just relax then. Eris, have you been following Nwakali whilst he’s been on loan? Thanks Kev for the update. We need the players fit to be able to challenge Chelski. They are on a high this season, but we need to win the FA cup to be able to salvage anything from this season. Kev, other than what I read off the media and the club’s official site, not much following for me. From what I have read, he had a great season with MVV Maastricht, scoring and assisting. I am not sure if he is ready to play for Arsenal but he isn’t short of confidence, if given a chance. Towards next season and given we have to play in the Europa league, priority will be to keep our best players, unless we have found equal replacements. Arsenal is still a big club and if Wenger stays, we will still retain that allure for big players, so long as we can pay what they want. My annoyance with all this is we won’t be able to great distraction of the Europa league to enable us focus on the EPL (it is a UEFA backed cup but, I would rather we avoided it – top 4 or 7th placement). Maybe, we should have Mourinho’s attitude about “trofees” and just go for it, at full hilt. See what comes of it. The banter from United fans has been extreme; you would think they weren’t in Europa league for the last two seasons; even completely out of Europe before that. Yet, they can deride Arsenal fans for dropping off CL places once in about 20 seasons. You can’t make this up. Mourinho and his predecessors have spent a vast fortune creating a very boring team, but difficult to beat. Probably perfect for the Europa Cup but will come unstuck in the Champions League. 17HT share your concerns about T A being in Manchester. My old employer have a big operation their, so am hoping they are also all ok. What a terrible thing to happen particularly with so many young children involved. It does put life into perspective. Cheers guys. I was in Manchester but luckily not at the horror scene. Just wrote a post about it which is not really for commenting but you can of course if you want to. Really looking fwd to Saturday.